Blog from Rotorua, New Zealand | What have we Dunn today?! 2 days catch-up again due to this NZ phenomena of people who seem amazed that I may ask for an internet connection after 8pm at night.. On the plus side, what a 2 days it has been! Before all that though, we last left you as we headed for a ferry in Picton to take us to the North Island. The small matter of torrential rain was still a minor concern.. 6pm ferry the tickets said. Head to the motor vehicle entrance round the bay from the terminal building the tickets said. Fair enough, we said! After making our way there through 3 road blocks and driving through 2 floods approximately the width and about half the depth of the English Channel, we arrived with the windscreen wipers going at the clappers and the wind trying its best to blow us over. We were immediately impressed by the modern line of covered booths used for check-in, and the screen above them giving instructions to the drivers arriving (which by the way numbered a total of 1!). Not so impressive was what they were saying: 'Please assemble at the main terminal building where you will be escorted to the vessel due to high winds and flooding'! GREAT STUFF!! Off we went again and managed to find the terminal (which was also flooded) reasonably easily. We then sat there until 8.15 when they finally took us to the boat! Glad to see the boat, we settled down for the 3hr journey with pack of cards in hand and waited until we left port. This happened at 8.45 and we knew we had left the harbour when we could no longer sit on our seats properly and every wall or floor you looked at was sitting at a funny angle! The conditions were rotten, as was the fact the journey became 3.5hrs long as a result. Louise felt even worse as she spent half the journey in the toilet with her new friend Huey. Ouch! Arriving in Wellington at 11.15pm we made our way to our latest campsite and got a few hours in before the start of day 1 in the North Island. As we awoke to the rain rattling off the roof and the duck quacking at the top of their voices, we knew this would be another wet one! After feeding said ducks half our loaf, we made our way to Wellington city centre for a brief encounter with the Parliament Buildings and our first 4 lane road before starting the long trek to Taupo. As the weather continued to give us grief, only the briefest of stops at LOTR film sites and the weirdest city of Palmerston North were made before arriving in Taupo at 8pm. Wow. Long drive, but glad to have made it to the heart of Kiwi country! This morning started like any other day, with one exception. A sadist had accidentally been brought in by our campsite to fit the showers! Hot water is free they say. What they don't tell you is that hot water is free, but only for the first 7 minutes of your shower! Hair half washed and covered in soap, I look at the dial. Still clearly shows hot as the temperature starts to plummet. Going from nicely warm to absolutely blooming freezing in around 2.3 milliseconds is hilarious at 8am as you can imagine. As is the fact it stays at that temperature until you either rinse yourself or have to jump out screaming like a girl. No comment on my reaction! 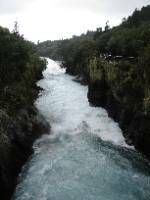 Leaving the campsite after this debacle, we headed for the Huka falls, a set of rapids just outside the town. Good to see, and made even better by the additional water available at this time of year! Given the 2 bus loads of screaming weans who arrived along with us, our visit here was brief, and we headed instead for 'the Craters of the Moon'! Now, I know we've driven far, but the moon?! 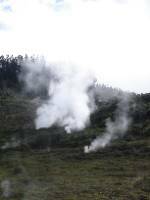 Turned out these were actually geothermal craters which emitted a lovely eggy smelling gas from the centre of the earth. Very unusual and a bit eerie as we were the only ones there. This was made even more odd by the strange sensation in the sky.. It actually went blue!! Yeeha! Some pictures later and a few crass jokes dished out, we decided we should move on to Rotorua for some more fun and games before the rain returned. Rotorua was reached pretty quickly which was nice as the driving has slightly lost its appeal after the Wellington to Taupo stint the day before. Once here, we made our way to the 'Kiwi Encounter' - a project designed to save the Kiwis who are not the most adaptable little birds to change. AMAZING! They are the most bizarre looking things you'll ever see, and we were given an amazing trip round the facility and its inhabitants by our personal tour guide Captain Camp. Honestly. This guy actually skipped across the car park to the front door. He described the kiwi rangers as 'these gorgeous, handsome men who roam the country looking for eggs for us'. WEIRDO!! 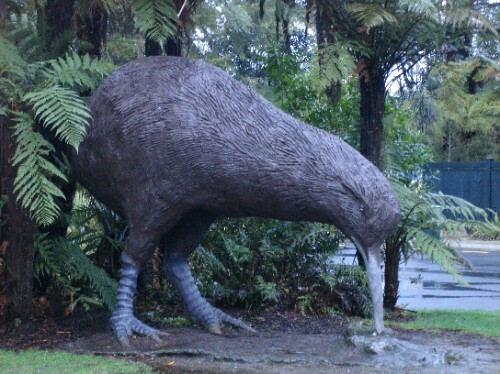 Kiwis viewed (although no photos available as they are nocturnal and don't like flashes!) we were especially lucky to be the final viewers of the day and managed to see Captain Camp at his most spectacular. It was his job to put on all of the lights in the Kiwi house (they are kept in a dark environment to simulate night as they are nocturnal) after entering the 3 enclosures to open their nesting boxes for them to sleep in. He actually managed one of the enclosures, which held a baby Kiwi about the size of a pigeon before starting to visibly shake at the prospect of also doing the young male and older female boxes. Let me explain: these birds are about the size of a grouse, and cannot even jump the metre high fencing surrounding there enclosures. They have a beak and 2 feet to hurt you with. He does this for a job..
'I think he's too close to the box for now.. I'll go to do the other one.. Oh.. No.. She's a bit close too..' We were getting bored by now and the Kiwis were clearly getting their PJs on ready for the wimp to just let them go to bed..! 'No.. I need to go and get some help..' he eventually explains. 'They both hate me. They could get really violent!' WHATEVER! Off he trots to find Emma, a 20 year old back-packer volunteer who jumps straight in, opens the box and receives a couple of blows to the leg from our Kiwi friend. I'd imagine the Kiwi might have got a bit more violent had it not been for the shrieking of our pal beside us. So funny.. So camp.. Stressed by this whole thing, we needed to relax, and where better to do this than in a thermal mud bath! Well, that's what we thought! Swimming cossies on, we were shown to the mud bath by a very heavily pierced old woman (odd too!) and somewhat surprised to see it was outdoors given the rain and 10 degree heat. It was also surprising that once done we were expected to have a cold shower aka hoselock hosedown to ensure our pores were closed. Whatever we thought as we got in. OOUUCCHH we thought as we felt the temperature of the mud. Roasting! Once in it was good until our time was up and the cols hose stared at us from the corner! Baltic. We then had a dip in a further thermal pool smelling the sulphur all the while. Just to let you know we left the spa 4 hours ago and all we can still smell is the sulphur! Honking! Off to Auckland tomorrow to prepare ourselves for our last continent. Hopefully have some more stories by then!